Synonyms and Other Names: Orconectes virilis (Hagen, 1870). Faxonius virilis underwent a reclassification in August 2017, changing the genus of non-cave dwelling Orconectes to Faxonius (Crandall and De Grave 2017). Identification: Individuals of this species can vary in color, ranging from a light- to olive-brown body with dark brown markings on each abdominal segment. Upper walking legs and chelae can be bluish. Tips of chelae are orange. Individuals have a long, broad rostrum and broad, flattened chelae with long fingers (Crocker and Barr 1968; Taylor et al. 2015). There is taxonomic confusion surrounding F. virilis and F. causeyi (Hobbs 1989). Faxonius nais is also often confused with F. virilis. They differ anatomically in gonopod structure; the lengthier gonopod element is more curved in F. nais (Johnson and Johnson 2008). Size: Individuals up to 13.1 cm carapace length have been collected (Z. Barnett, unpublished data). Native Range: Broadly, F. virilis is native to the Great Lakes, Missouri River, upper Mississippi River, and lower Ohio River and up to east of the continental divide in Montana (Taylor et al. 2015), with disjunct populations in the Black River in Missouri and Arkansas, the upper White River in Oklahoma and Arkansas, the Red River in Texas and Oklahoma, and Lake Champlain in New York (C. Taylor, pers. comm.). Its native range in Arkansas and Oklahoma is uncertain, but it is known to be native in the Upper Black River, Upper Illinois River, and Upper White River drainages in northern Arkansas and eastern Oklahoma (C. Taylor, pers. comm.) and possibly drainages along the Texas-Oklahoma border (D. Johnson, pers. comm.). Its native range in Texas is uncertain; probably includes northeastern Texas in Bois D’arc-Island, Denton, East Fork Trinity, Elm Fork Trinity, Farmers-Mud, Lake Texoma, and Upper Trinity drainages (D. Johnson, pers. comm.). Faxonius virilis is native east of the continental divide in Montana (Crocker and Barr 1968). Its native range in southern Missouri is uncertain, but it is probably in the Upper Black River drainage (C. Taylor, pers. comm.) and in the Mississippi River drainage north of the “Bootheel” (the southeastern corner of Missouri; B. Williams, pers. comm.). Its native range in New York includes the Ausable River, Chateaugay-English, Eastern Lake Erie, Lake Champlain, Salmon, Saranac River, and St. Regis drainages (Crocker 1957; C. Taylor, pers. comm.). Table 1. States with nonindigenous occurrences, the earliest and latest observations in each state, and the tally and names of HUCs with observations†. Names and dates are hyperlinked to their relevant specimen records. The list of references for all nonindigenous occurrences of Faxonius virilis are found here. Ecology: Faxonius virilis is found in streams with moderate flow and turbidity, abundant cover, muddy, sandy, or rocky substrate and stable water levels (Crocker and Barr 1968; Maude and Williams 1983; Z. Barnett, pers. comm.). This species is inhibited by high velocity flow (Maude and Williams 1983). Faxonius virilis does not burrow, but may tunnel (Pflieger 1996). Mating occurs during two periods: August to October and April to May, and eggs are laid in spring (Crocker and Barr 1968). Pflieger (1996) observed larger males than females in Missouri, while Z. Barnett (pers. comm.) reported no size difference in Alabama. Means of Introduction: Probable introduction methods include bait bucket introduction (Larson and Olden 2011; Kilian et al. 2012) and intentional stocking for forage (Larson and Olden 2011). It has been stocked as forage in Montana by Montana Fish, Wildlife and Parks (Sheldon 1989) and in Utah (Johnson 1986) in several locations. Status: Faxonius virilis is established in 24 states: Alabama (Taylor et al. 2007), Arizona (Davidson et al. 2010), California (Ruiz et al. 2000), Colorado (Clark and Lester 2005; Hobbs 1989; Martinez 2012), Connecticut (Beauchene 2011), Idaho (Lester and Clark 2005; Idaho Species Catalog 2016), Maine (Crocker 1979), Maryland (Schwartz et al. 1963), Massachusetts (Crocker 1979; Taylor et al. 2007), west of the continental divide in Montana (Sheldon 1989), Nevada (Johnson 1986), New Hampshire (Crocker 1979; Taylor et al. 2007), New Mexico (Taylor et al. 2007), North Carolina (Cooper and Armstrong 2007; Simmons and Fraley 2010), Ohio (Thoma and Jezerinac 2000; Taylor et al. 2015), Pennsylvania (GBIF 2016; Smithsonian Institution 2014), Rhode Island (Crocker 1979; Taylor et al. 2007), Tennessee (Hobbs 1989; Illinois Natural History Survey 2017; Taylor et al. 2007), Utah (Taba et al. 1965; Johnson 1986; Clark and Lester 2005; Larson and Olden 2011), Vermont (Guarino et al. 2012; Taylor et al. 2007; Crocker 1979), Virginia (Virginia Fish and Wildlife Information Service 2016), Washington (Larson et al. 2010), West Virginia (Loughman and Welsh 2010), and Wyoming (Johnson 1986; Hubert 1988; Larson and Olden 2011). It is likely a failed introduction (no longer present) in Mississippi due to no recent collections (S. Adams, pers. comm.). Its status is unknown in New Jersey (Hobbs 1989; Taylor et al. 2007), as the only reported introduction was from Hobbs (1989). Impact of Introduction: Introduction of F. virilis can potentially cause decline or local extirpation of native crayfish (Loughman and Welsh 2010) and threaten freshwater biodiversity and macroinvertebrate community abundance and structure (Hanson et al. 1990; Clark and Lester 2005; MDNR 2016). This species is known to eat juvenile reptiles and amphibians, fish eggs, and macroinvertebrates (Recsetar and Bonar 2015). In the Netherlands, water bodies that have been invaded by F. virilis have shown decreases in water quality and macrophyte (plant) biomass (Roessink et al. 2017). Faxonius virilis is the most abundant and widespread non-native crayfish in Maryland, and is associated with the decline of native spinycheek crayfish (F. limosus) and Allegheny crayfish (F. obscurus). Both native species are now extirpated from many watersheds where F. virilis is currently abundant (MDNR 2016). Remarks: Faxonius virilis abundance decreased with stream restoration, including substrate modification by travertine and exotic fish predation (Adams and Marks 2016). Using this species as a human food resource can also potentially decrease the abundance of introduced populations (Crocker 1957; Pflieger 1996). The native range of F. virilis in Arkansas, Missouri, Oklahoma, and Texas is uncertain. Additional native drainages are likely in Oklahoma and southern Missouri (C. Taylor, pers. comm. ; D. Johnson, pers. comm.). The connectivity of native range drainages in Texas and Arkansas to adjacent drainages in Oklahoma and southern Missouri imply that these drainages in Oklahoma and southern Missouri might be native (C. Taylor, pers. comm. ; D. Johnson, pers. comm.). Adams, K.J., and J.C. Marks. 2016. 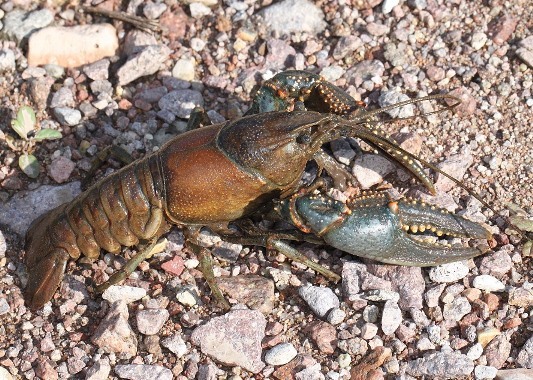 Population response of the invasive crayfish Orconectes virilis (Hagen, 1870) (Decapoda: Astacoidea: Cambaridae) to restoration: What are the consequences of changes in predatory regulation and physical habitat in Fossil Creek, Arizona, USA? Journal of Crustacean Biology 36(5):597-606. http://dx.doi.org/10.1163/1937240X-00002471. Beauchene, M. 2011. Crayfish distribution project. Connecticut Department of Energy and Environmental Protection, Bureau of Water Protection and Land Reuse, Hartford, CT. http://www.ct.gov/deep/lib/deep/water/water_quality_management/monitoringpubs/2011_crayfishdist.pdf. Accessed on 10/27/2016. Clark, W.H., and G.T. Lester. 2005. Range extension and ecological information for Orconectes virilis (Hagen 1870) (Decapoda: Cambaridae) in Idaho, USA. Western North American Naturalist 65(2):164-169.
Cooper, J.E. 2003. A report on adventive crayfishes in North Carolina. North Carolina State Museum of Natural Sciences, Raleigh, NC. Cooper, J.E., and S.A. Armstrong. 2007. Locality records and other data for invasive crayfishes (Decapoda: Cambaridae) in North Carolina. Journal of the North Carolina Academy of Science 123(1):1-13. Crocker, D.W. 1957. The crayfishes of New York State (Decapoda, Astacidae). University of the State of New York, Albany, NY. Crocker, D.W. 1979. The crayfishes of New England. Proceedings of the Biological Society of Washington 92:225-252. Crocker, D.W., and D.W. Barr. 1968. Handbook of the crayfishes of Ontario. University of Toronto Press, Toronto, Ontario. Davidson, E.W., J. Snyder, D. Lightner, G. Ruthig, J. Lucas, and J. Gilley. 2010. Exploration of potential microbial control agents for the invasive crayfish, Orconectes virilis. Biocontrol Science and Technology 20(3):297-310. http://dx.doi.org/10.1080/09583150903514023. GBIF. 2016. Global Biodiversity Information Facility (GBIF) Database. Global Biodiversity Information Facility. http://www.gbif.org/. Accessed on 10/27/2016. Guarino, J., C. Gastador, and E. Miller. 2012. 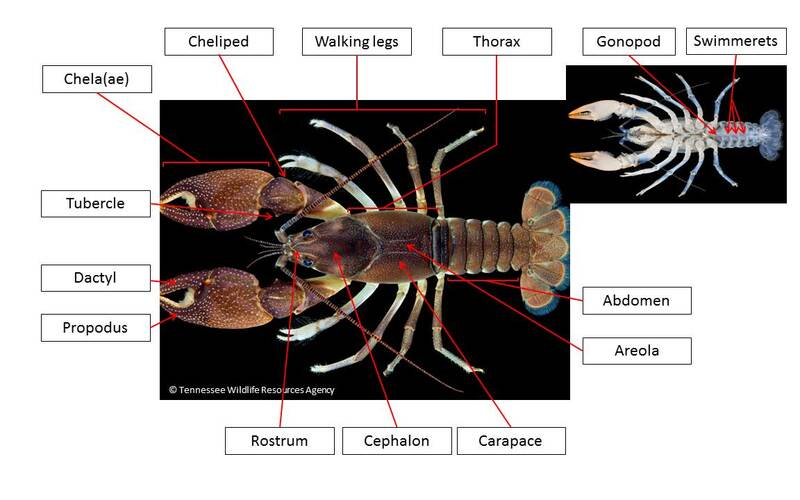 Field guide to the crayfish of the White River watershed, east-central Vermont. White River Partnership and Verdana Ventures, LLC, Randolph, VT. http://whiteriverpartnership.org/wp-content/uploads/2014/04/Field-Guide-to-the-Crayfish-of-the-White-River-Watershed.pdf. Accessed on 10/27/2016. Hanson, J.M., P.A. Chambers, and E.E. Prepas. 1990. Selective foraging by the crayfish Orconectes virilis and its impact on macroinvertebrates. Freshwater Biology 24:69-80. Hubert, W.A. 1988. Survey of Wyoming crayfishes. Great Basin Naturalist 48(3):370-372. https://ojs.lib.byu.edu/spc/index.php/wnan/article/viewFile/28867/27330. Idaho Species Catalog. 2016. Virile crayfish (Orconectes virilis). Idaho Department of Fish and Game. https://idfg.idaho.gov/species/taxa/25571. Accessed on 10/27/2016. Illinois Natural History Survey. 2017. Illinois Natural History Survey Collection Databases. Illinois Natural History Survey. https://biocoll.inhs.illinois.edu/portalx/collections/index.php. Accessed on 08/15/2017. Integrated Taxonomic Information System (ITIS). 2016. Orconectes virilis. https://www.itis.gov/servlet/SingleRpt/SingleRpt?search_topic=TSN&search_value=97425#null. Accessed on 10/27/2016. Johnson, J.E. 1986. Inventory of Utah crayfish with notes on current distribution. Great Basin Naturalist 46(4):625-631. Johnson, S.K., and N.K. Johnson. 2008. Texas Crawdads. Crawdad Club Designs, College Station, TX. Larson, E.R., C.A. Busack, J.D. Anderson, and J.D. Olden. 2010. Widespread distribution of the non-native northern crayfish (Orconectes virilis) in the Columbia River Basin. Northwest Science 84(1):108-111. Larson, E.R., and J.D. Olden. 2011. The state of crayfish in the Pacific Northwest. Fisheries 36(2):60-73. http://www.aquaticnuisance.org/wordpress/wp-content/uploads/2011/03/Fisheries_2011_State_of_Crayfish.pdf. Loughman, Z. J., and S.A. Welsh. 2010. Distribution and conservation standing of West Virginia crayfishes. Southeastern Naturalist 9(3):63-78. https://www.researchgate.net/profile/Zachary_Loughman/publication/232689227_Distribution_and_Conservation_Standing_of_West_Virginia_Crayfishes/links/02e7e52b1a3173c17f000000.pdf. Martinez, P.J. 2012. Invasive crayfish in a high desert river: Implications of concurrent invaders and climate change. Aquatic Invasions 7(2):219-234. http://dx.doi.org/10.3391/ai.2012.7.2.008. Maude, S.H., and D.D. Williams. 1983. Behavior of crayfish in water currents: hydrodynamics of eight species with reference to their distribution patterns in southern Ontario. Canadian Journal of Fisheries and Aquatic Sciences 40:68-77. Maryland Department of Natural Resources (MDNR). 2016. Maryland Aquatic Nuisance Species Management Plan. Maryland Department of Natural Resources, Annapolis, MD. Pflieger, W.L. 1996. The crayfishes of Missouri. Missouri Department of Conservation, Jefferson City, Missouri. Recsetar, M.S., and S.A. Bonar. 2015. Effectiveness of two commercial rotenone formulations in the eradication of Virile Crayfish Orconectes virilis. North American Journal of Fisheries Management 35:616-620. http://dx.doi.org/10.1080/02755947.2015.1017127. Riegel, J.A. 1959. The systematics and distribution of crayfishes in California. California Fish and Game 45(1):29-50. Roessink, I., Gylstra, R., Heuts, P. G. M., Specken, B., and F. Ottburg. 2017. Impact of invasive crayfish on water quality and aquatic macrophytes in the Netherlands. Aquatic Invasions 12(3):397-404. Schuster, G.A., C.A. Taylor, and J. Johansen. 2008. An annotated checklist and preliminary designation of drainage distribution of the crayfishes of Alabama. Southeastern Naturalist 7: 493–504. Schwartz, F.J., R. Rubelmann, and J. Allison. 1963. Ecological population expansion of the introduced crayfish, Orconectes virilis. Ohio Journal of Science 63(6):266-273. Sheldon, A.L. 1989. A reconnaissance of crayfish populations in western Montana. Montana Department of Fish, Wildlife and Parks. Simmons, J. W., and S. J. Fraley. 2010. Distribution, status, and life-history observations of crayfishes in western North Carolina. Southeastern Naturalist 9(sp3):79-126. http://dx.doi.org/10.1656/058.009.s316. Smithsonian Institution. 2014. National Museum of Natural History specimen collections. Accessed via GBIF data portal, http://www.gbif.org/dataset/5df38344-b821-49c2-8174-cf0f29f4df0d. Accessed on 10/27/2016. Taba, S.S., J.R. Murphy, and H.H. Frost. 1965. Notes on the fishes of the Colorado River, near Moab, Utah. Proceedings of the Utah Academy of Science 42(2):280-283. http://www.nativefishlab.net/library/textpdf/13441.pdf. Taylor, C.A., G.A. Schuster, and D.B. Wylie. 2015. Field guide to crayfishes of the Midwest. Illinois Natural History Survey, Champaign, IL. Thoma, R.E., and R.E. Jezerinac. 2000. Ohio Crayfish and Shrimp Atlas. Ohio Biological Survey Miscellaneous Contribution, Columbus, OH: 9. USGS BioData. 2017. Aquatic Bioassessment Data for the Nation. https://aquatic.biodata.usgs.gov. Accessed on 06/22/2017. USDA. 2014. Crayfishes of Mississippi: Crayfish Distribution Map: Orconectes (Gremicambarus) virilis. https://www.srs.fs.usda.gov/crayfish/distmaps/CFDistMap124.pdf. Virginia Fish and Wildlife Information Service. 2016. Occurence chapter for Crayfish, Virile (070119). Virginia Department of Game and Inland Fisheries. http://vafwis.org/fwis/booklet.html?Menu=_.Occurrence&bova=070119&version=17101. Accessed on 10/27/2016.